The two man post hole auger is a versatile machine that can be used for fencing, decks, landscaping, sign erection, and soil sampling. The machine features a centrifugal clutch and a finger operated, return-style throttle. Each operator also has access to a stop switch for added safety. 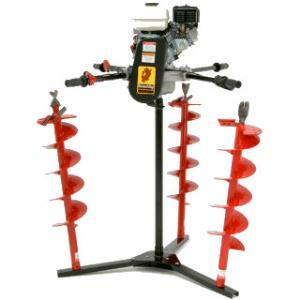 Available auger sizes are 4", 8", and 12" and bits are 36" in length. Auger extensions are also available. * Please call us for any questions on our post hole digger 2 man rentals in Hillsdale and Ridgewood NJ.